Bambusa Phyllostachys Nigra - black bamboo - is the most distinctive of all the Phyllostachys. Its intensely black culms have a deep gloss resembling polished ebony. 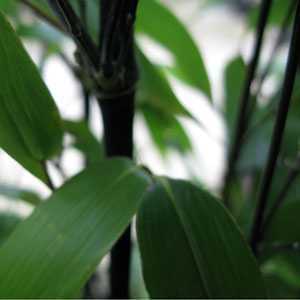 When planting Bamboo's, use a sunken root barrier to prevent the Bamboo invading other areas of the garden with its runners. I would need to be watered regularly during dry periods! In spring, remove any weak, dead, damaged or spindly canes, cutting them to ground level with secateurs or loppers. 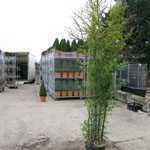 To show off plants to their best, remove some of the foliage from the bottom of the canes. Cut them back with secateurs, pruning as close to the main cane as possible to leave a smooth finish. Please Note: Due to the nature of the item this price does NOT include delivery. Please call 01279 792869 for details.